Today's entry is inspired by a post that appeared on the QATestLab blog called "Why Are Software Testers Disliked By Others?" I posted an answer to the original blog, but that answer started me thinking... why does this perception exist? Why do people feel this way about software testing or software testers? There's a lot of jokes and commentary that go with being a software tester. One of the most common being "if no one is talking about you, you're doing a great job". Historically, Quality Assurance and Software Testing was considered somewhat like plumbing. If we do our jobs and we find the issues and they get resolved, it's like the plumbing that drains our sinks, tubs, showers and toilets. Generally speaking, we give the pipes in our walls next to no thought; that is, until something goes wrong. Once there's a back up, or a rupture, or a leak, suddenly plumbing becomes tremendously present in our thoughts, and usually in a negative way. We have to get this fixed, and now! Likewise, software testers are rarely considered or thought about when things are going smoothly, but we are often looked at when something bad has happened (read this as "an issue has made itself out into the wild, been discovered, and been complained about"). This long time perception has built some defensiveness for software testers and software testing, to the point where many testers feel that they are the "guardians of quality". We are the ones that have to find these horrible problems, and if we don't, it's our heads! It sounds melodramatic, but yes, I've lived this. I've been the person called out on the carpet for missing something fundamental and obvious... except for the fact that it wasn't fundamental or obvious two days before, and interestingly, no one else thought to look for it, either. 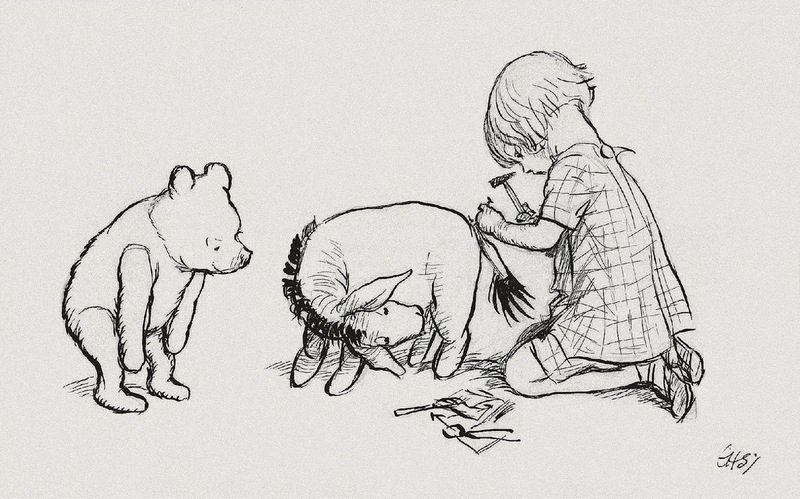 We can be forgiven, perhaps, for bringing on ourselves what I like to call an "Eeyore Complex". For those not familiar, Eeyore is a character created by A.A. Milne, and figures in the many stories of "Winnie the Pooh". Eeyore is the perpetual black raincloud, the one who finds the bad in everything. Morose, depressing, and in many ways, cute and amusing from a distance. We love Eeyore because we all have a friend that reminds us of him. The problem is when we find ourselves actually being Eeyore, and for many years, software testing deliberately put itself in that role. We are the eternal pessimist. The product is broken, and we have to find out why. Please note, I am not actually disagreeing with this; the software is broken. All software is, at a fundamental level. It actually is our job to find out where, and advocate that it be fixed. However, I have to say that this is where the similarities must end. Finding issues and reporting/advocating for them is not in itself a negative behavior, but it will be seen as such if we are the ones who present it that way. Instead, I'd like to suggest we model ourselves after a different figure, that of Spock. 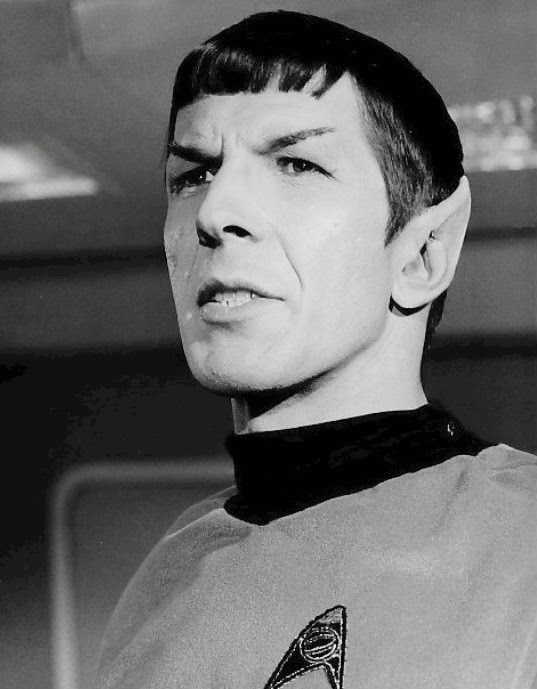 Yes, the Spock of Star Trek. Why? Spock is logical. He is, relatively speaking, emotionless, or at least has tremendous control over them (he's half human, so not devoid of them). Think about any Star Trek episode where Spock evaluates a situation. He examines what he observes, he makes a hypothesis about it, tests the hypothesis to see if it makes sense, and then shares the results. Spock is anything but a black raincloud. He's not a downer. In fact, he just "is". He presents findings and data, and then lets others do with that information what they will. Software testers, that is exactly what we do. Unless we have ship/no ship decision making authority, or the ability to change the code to fix what is broken (make no mistake, some of us do), then presenting our findings dispassionately is exactly what we need to be doing. If people disagree with our findings, that is up to them. 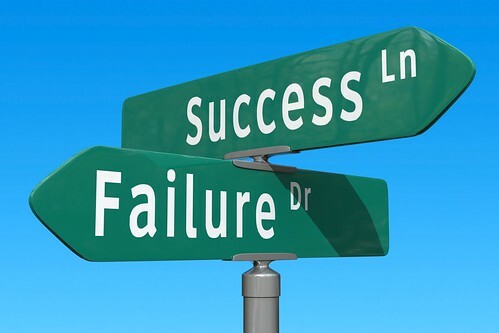 We do what we can to make our case, and convince them of the validity of our concerns, but ultimately, the decision to move forward or not is not ours, it's those with the authority to make those decisions. In my work life, discovering this, and actually living by it, has made a world of difference in how I am perceived by my engineering teams, and my interactions with them. It ceases to be an emotional tug of war. It's not a matter of being liked or disliked. Instead it is a matter of providing information that is either actionable or not actionable. How it is used is ultimately not important, so long as I do my best to make sure it is there and surfaced. At the end of the day, software testers have work to do that is important, and ultimately needs to be done. We provide visibility into risks and issues. We find ways in which workflows do not work as intended. We noticed points that could be painful to our users. None of this is about us as people, or our interactions with others as people. It's about looking at a situation with clear understanding and knowing the objectives we need to meet, and determining if we can actually meet those objectives effectively. Eeyore doesn't know how to do that. Spock does. If you are struggling with the idea that you may not be appreciated, understood, or liked by your colleagues, my recommendation is "less Eeyore, more Spock". I've had a back and forth involvement with standing desks over the years. I've made cheap options, and had expensive options purchased for me. I've made a standing desk out of a treadmill, but it has been best for passive actions. It's great for reading or watching videos, not so great for actually typing, plus it was limiting as to what I could put on it (no multi monitor setup). Additionally, I've not wanted to make a system that would be too permanent, since I like the option of being flexible and moving things around. I'm back to a standing desk solution for both home and work because I'm once again dealing with recurring back pain. No question, the best motivation for getting back to standing while working is back pain. It's also a nice way to kick start one's focus and to get involved in burning a few more calories each year. I'll give a shout to Ben Greenfield, otherwise known as "Get Fit Guy" at quickanddirtytips.com for a piece of information that made me smile a bit. He recommends a "sit only to eat" philosophy. In other words, with the exception of having to drive or fly, my goal should be to sit only when I eat. All other times, I should aim to stand, kneel, lie down or do anything but sit slumped in a chair. The piece of data that intrigued me was that, by doing this, I'd be able to burn 100 additional calories each day. In a week's time, that's the equivalent of running a 10K. The upturned wastebasket is an essential piece of this arrangement. It allows me to shift the weight from leg to leg, and to give different muscles in my back some work, and to rest other areas from time to time. I've also set up a similar arrangement at home, but added an EKBY ALEX shelf (I'll update with a picture when I get home :) ). This gives me a little extra height and some additional storage for small items. The true beauty of this system is that it can be broken down quickly and moved anywhere with very little effort, and is much less expensive than comparable systems I have seen. If you'd like to make something a little more customized, with a pair of shelf brackets and a matching 48" shelf, you can make a keyboard tray, though for me personally, the table height works perfectly. What I find most beneficial about a standing desk, outside of the relief from back pain, is the fact that it is incredibly focusing. When I sit down, it's easy to get into passive moments and lose track of time reading stuff or just passively looking at things. When I stand, there is no such thing as "passive time". It's very focusing, and it really helps me to get into the zone and flow of what I need to do. For those looking to do something similar, seriously, this is a great and very inexpensive way to set up a standing desk. Packt Publishing says "FREE LEARNING - HELP YOURSELF!" Something's in the air, I think. Maybe it's a new year of possibilities, maybe it's the nature of technical advancement and growth that happens each year, but there seems to be a groundswell in opportunities for programmers, testers and DIYers to learn new stuff all the time, often very close to free, and in many cases, just plain outright for free. Packt Publishing recently did this with their 24 gifts for Christmas, in which they offered ebooks for free each day for a limited time, and they are back at it again with their "FREE LEARNING - HELP YOURSELF!" initiative, and again, available for a limited time. "Packt is here to help you develop, and that's why we're offering you and other IT professionals 18 days of Free Learning -- from today (February 16, 2015) until March 5, 2015, you can claim a free eBook every day here. 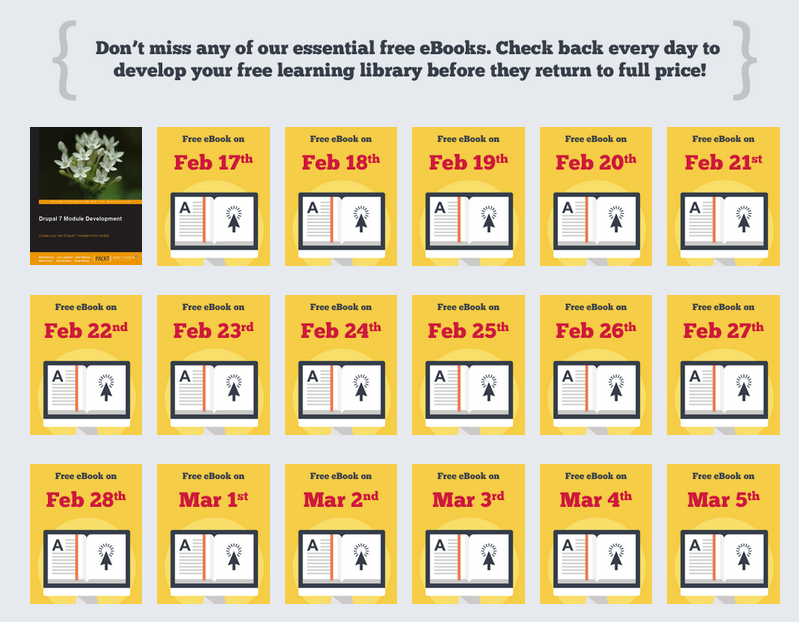 Each eBook will only be available for free for 24 hours, so make sure you come back every day to grab your Free Learning fix! We'll be featuring a diverse range of titles from our extensive library, so don't miss out on this amazing opportunity to develop some new skills and try out new tech. Starting today, they are offering a title related to developing in Drupal. Not something you're currently interested in? 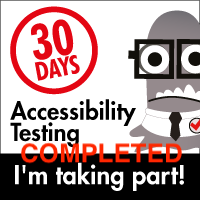 That's OK, check back tomorrow; there may be something else that will be interesting. As Packt Publishing and a number of other vendors have been super helpful to give me free materials throughout the past five years, and in a sense, contribute greatly to the overall content of the TESTHEAD blog, I'm happy to help spread the word for these promotions when they provide them, so if you want to take advantage of them, check in each day over at Packt and see if they have something interesting for you. I certainly will be! With the "Humble Braniac Book Bundle" still underway, I felt it only fitting to keep the trend going and review books that are geared towards kids and those who want to have a quick introduction to the worlds of programming, web design and engineering. 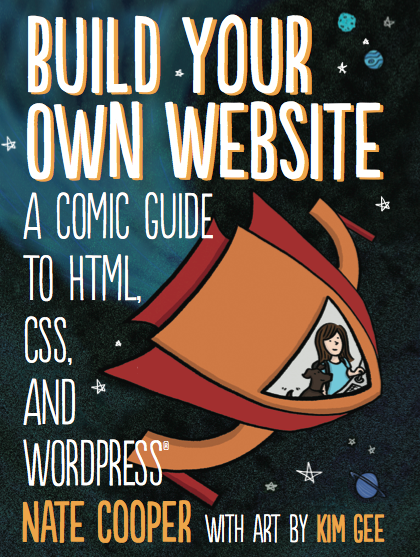 My daughter and I are exploring a lot of these titles at the moment, and one that caught my eye was "Build Your Own Website", primarily because it promised to be "A Comic Guide to HTML, CSS and WordPress", and that indeed it is. I should probably mention that by "a comic guide", it does not mean in the funny sense (though some of it is), but in the illustrated, graphic novel sense. For those familiar with NoStarch Press and their "The Manga Guide to..." series of books, Nate Cooper's writing and Kim Gee's artwork fits very well in that space. What's more, "Build Your Own Website" follows the same template that "The Manga Guide to..." books do, in that each section starts with an illustrated graphic novel treatment of topics, and then follows on with a more in depth prose treatment of each area. So what's in store for the reader who wants to start on a mission to make their own site from scratch? Chapter 1 starts with our protagonist Kim looking forward to her first web design class, and shows that inspired and excited first timer's desire to get in and do something. It's followed by an explanation of the tools needed to be downloaded and do the work necessary to complete the examples in the book. All of the exercises and examples can be done for free, all you need is a web browser or two, a text editor, an ftp client (the book recommends FileZilla; it's the one I use as well) and you can get a free WordPress account at http://www.wordpress.com. Chapter 2 talks about The Trouble with HTML, and how Kim and her dog Tofu meet up with the Web Guru, who introduces them to the basics of HTML, paths and naming conventions, loading pictures and following links, the hierarchy of files and directories that make up a basic web site, and a dragon called "404". The second section goes into details about all of these including explaining about document structure, HEAD and BODY tags, the items that go in each, embedding images, and a basic breakdown of the most common HTML tags. Chapter 3 shows us how Kim Makes Things Look Great with CSS. Well, Glinda, the Good Witch of CSS helps Kim do that (graphic novel for kids, gang. Work with me, here ;) ). Glinda shows Kim the basics of CSS including classes and IDs, inline styles and external stylesheets that can be referenced along with inline styles, effectively creating a "cascade of styles" (CSS == "Cascading Style Sheets"). The chapter also discusses using div's for creating separate sections and blocks that CSS can be applied to, and ends with commonly used CSS properties. Chapter 4 is where Kim Arrives in WordPress City, and where the examples focus on, of course, WordPress as a composition platform. Kim gets introduced to what WordPress is, which is a Content Management System (CMS), and the conventions of creating both blogs and websites. Kim is introduced to the Dashboard, creating posts, using the Visual editor, structuring her site, using Categories and Tags, using the Media Library to store media items, and the overall Theme to be used for the site. Each of these is covered in greater detail with examples in the second prose part. Chapter 6 brings us to The Big Launch, where Kim and Tofu navigate the realities of hosting the site and how to set up hosting so that they can display their finished site to the world. There's lots of options, and most cost some money, but not very much (plans ranging from $5-$10 a month are readily available). Registering a domain is covered, and many sites have an option to install WordPress and use it there. "Build Your Own Website" starts with some basic HTML and CSS, and then spends the bulk of the second half of the book introducing you, the user, to WordPress. For those looking to see the nuts and bolts of making a web site from scratch, including making the navigation elements, more involved interactions, and other esoteric features of web sites outside of the CMS system that WordPress provides, you will be disappointed. Having said that, if the goal is to get a site up and running and using a well designed and quick to use interface, WordPress is a pretty good system, with lots of flexibility and ways to make the basic formatting of a site nearly automatic. Younger web development acolytes can get in and feel what it's like to design and manage a site. To that end, "Build Your Own Website" does a very good job, and does it in an entertaining and engaging manner. Writing the "Michael Larsen" Way? First off, I have to say "thank you" to my friend Jokin Aspiazu for inspiring this post today. He wrote a piece about writing a blog from your own experiences and how he found inspiration from a number of people, including me. "The Michael Larsen way. He wakes up early, so he has time to write before his daily routines start. The thing is that if you write late at night, when the day is gone, you are going to be tired in body and mind. And your writing won’t be as fluid as you would like, and the next day, when you read your text, you will hear “I’m so tired…” in the background." I have to say that this is mostly correct. 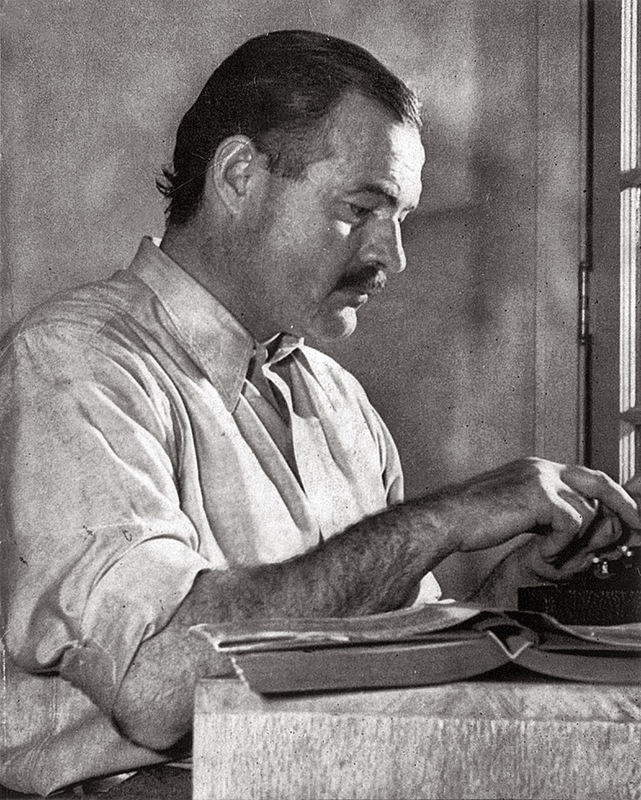 If given a choice, I much prefer writing in the early morning over any other time of day. I think Jokin was referencing a comment I said to him at EuroSTAR when we were talking about the ideal times to do certain things, and that for me, that sweet spot is early in the morning, and by early, I mean any time before 6:00 a.m. The quote, as I remember saying it (because I do say this a lot ;) ), is that "I can get a lot done while everyone else I know and relate with is asleep". Having said that, there are a few other things that I do, and I find them helpful as well. Oh, Voice Recorder, how kind you are to me. You make it possible for me to capture any insane and rambling thought I might have, and not lose it to the ether. I should also add I am grateful for the headphone and mic combinations now available with SmartPhones, because they make me look like less of a lunatic while I am walking down the street. Some great spots where I can let loose with my thoughts are on my daily commute legs. I park my car about a half mile from the train station I use because I'm cheap and don't want to pay for a parking permit, but also because it gives me a bit of a walk each day. That walk is often a golden time to think out loud (something I do regularly), and having the voice recorder lets me capture all of that. Also, it gives people walking past me the impression I'm just talking to someone on the phone, so I'm not looked at as though I'm crazy ;). Often, the ramblings don't amount to much, and those I tend to delete at the end of each week, but every so often, I'll find something that sticks, or that gives me a reason to say "OK, I want to explore that some more". Often that will result in something I want to write about. Generally speaking, I love to read. Though my book buying habits have changed with Kindle apps and e-books, I still love having a lot of choices to choose from and read from. My SmartPhone has become my secondary reading device, but my first is my laptop computer. I often find myself reading books and grabbing passages or parts of a book that I have found interesting, and I pull them over into a Notes app that I use. Sometimes they sit there for months, but every once in awhile, something will happen, or I'll see something that jumps out at me and I'll say "hey, that fits into a problem I'm dealing with". Very often, those discoveries are not limited to technical books or books about testing. I'm a fan of history, and I love reading about interesting things that have happened in the past, both distant and more recent. I often borrow the Dan Carlin quote of "history has all but ruined fiction for me", and that shows up in the things that I read. It's rare that you will find me reading fiction, though I do from time to time. Most of the time, it's non fiction of a historical, technological, or business perspective. Those lessons often make their way into my posts. "That Reminds me of a Testing Story..."
I owe this phrase to the Cartoon Tester, aka Andy Glover. He used it as a comical way of showing the different type of testers out there, but it illustrated something I frequently try to do. Even in the mundane aspects of my life, I find things that both inform my testing, and also inform my view of the world as I see it, which in turn informs my testing. Something as simple as a way to mow the lawn, or deal with pests in the yard, or trying to manage the delicate balance of life in my fish tanks, or the daily dilemmas my kids face, or the often interesting and noteworthy events that happen in my role as a Scout Leader, all of these shape what often becomes an analogy to software testing. They may be helpful to others, they may not, but overall, I remind myself that they are helpful to me. Whether they be specific to ideas, events, or interactions with individuals, each of them informs what I do, and gives me ideas of ways that I can do it better... maybe :). Again, I want to thank Jokin for helping me consider this, and give me a chance to respond a little more in depth. While everything Jokin says is accurate, I hope this gives you a little more of a glimpse into how I think and work, and how I like to gather material that ultimately makes its way into my blog. If these ideas help you to write better, more frequently, or at least think a little differently about how you write, awesome. If not, again, it felt good to give some additional thoughts as to what writing "the Michael Larsen way" actually means, at least to me. As I have been working with my daughter to learn programming, we have been focusing on learning Python. We chose Python primarily because it was something I felt we could both come at from a similar frame of reference. I had worked with Python but in limited capacity, and Amber had not really worked with any programming languages. By working on Python, we could be somewhat closely matched with what we were learning. NoStarch Press has a number of books that are ideally suited for younger programmers, and to that end we both decided to look at the books together. We will be doing three “for Kids" books reviews during February, provided we can get through all of them. All journeys have to start somewhere though, and this journey will start with Python for Kids. I should also mention that, for a limited time, you can get Python for Kids as part of the NoStarch and Humble Bundle "Humble Brainiac Book Bundle" offer, which comes with a lot of other additional books. Python for Kids is written in a way that lets the user, whether they are kids or adults, readily get into the material and see how the examples work and try them out for themselves. Chapter 1 starts out with installing and using Python 3, so right away Amber and I had to adjust to the new syntax (Codecademy’s Python modules are still based on Python 2). Be aware that there are some subtle differences with Python 3, one of the main ones being the parentheses required when using the print(“text goes here”) function (yeah, like that ;) ). Chapter 2 introduces the user to calculate values using simple equations via operators, using parentheses to ensure the desired order of operations, and creating and using variables to store values for use in those calculations. Chapter 3 introduces strings, lists, tuples, and maps, each of which allows the user to manipulate text in a variety of ways. Each of the approaches has rules as to how to move items and how they are represented, ranging from simple strings with are just quoted sentences, up to maps which have keys and values that can be called as needed. Chapter 4 introduces the user to drawing methods, and in this case, that involves using a module called turtle (which in turn uses a tool called tinter). Using this tool, we can actually draw the turtles movements with lines moving left and right, moving forward and backward, as well as starting and stopping with up and down commands. Chapter 5 focuses on asking questions and responding based on the response the system gets. For experienced programs, this i about if statements and their related commands (elif, else) and how commands allow for combining conditions (using and/or) and converting values (using int, str, float and none). Chapter 6 talks about “Going Loopy” which, as you might guess, deals with handling loop conditions and repetitive tasks. for and while loops are covered, and break conditions are shown to, well, break out of loops. Chapter 7 talks about ways to recycle code and reuse it defining and using Functions and importing Modules. Variable scope is also covered so as to see where values are assigned, used and passed back and forth. Chapter 8 focuses on the things in python, otherwise known as classes and objects. this chapter covered the details of classes and how they an be used to create instances, and how objects can be created, call functions to work with objects, and assigning object variables to save values in those objects. Chapter 9 covers the various built-in functions available in Python, those that we can import into Python programs and use directly (functions like abs, bool, print, float, int, len, etc) as well as howe to open and manipulate files. Chapter 10 covers a variety of helpful modules, such as copy, keyword, random, shuffle, and the sys module that allows the user to control the Python shell itself, reading input with stdin, writing output with stdout, telling time with the time module, and using pickle to save user information in files (yes, there’s a module called pickle ;) ). Chapter 11 revisits turtle, and how we can use it to draw a variety of items. including basic geometric shapes, changing the pen color, filling shapes and reusing steps in functions to combine drawing shapes and using multiple colors in one function call. Chapter 12 covered using tkinter to make “better graphics” and my oh my does this take me back. I used Tcl/Tk back in the 90s for a number of things, and the syntax to use tkinter is very familiar. Simple shapes, event bindings so objects can move when keys are pressed, using identifying numbers to move shapes and change colors are all covered here. Part II gives the user a chance top practice the programming chops they have developed in the first Part by making a ball bouncing game called, appropriately enough, Bounce! Chapter 13 starts out using the tinter module, in which we can create a class for a ball and move it around the screen. Coordinates can be set so that it will bounce off of the top and corners of the screen, and a randomized option so the ball has a dynamic movement. Chapter 14 continues with creating classes for the paddle, and using coordinates to see if the ball hit the paddle. Event bindings tie the left and right arrow keys to control the paddle, and make it so, if the player misses the ball, the game ends when the ball hits the bottom. Part III continues the ideas so far shown with “Mr. Stick Man Races for the Exit”. Chapter 15 shows how to make graphical images of, you guessed it, a stick man (using GIMP to make the actual images) and making the backgrounds of the images transparent so they won’t cover up other things. Chapter 16 covers creating a Game class making a background image. By using functions called within_x and within_y, we can determine if items have collided with other items. We also discover Sprites and a sub-class, PlatformSprite, to draw the platforms on the screen. Chapter 17 walks through the details for taking the pictures we created for Mr. Stick Man back in Chapter 15 and setting up options for the figure to move, turn and jump. Chapter 18 finishes off the Stick Man game, and shows that putting together a working game is not trivial, but it’s also not a huge endeavor either. We focus on using the images we made for Mr. Stick Man so he appears to be running, use collision detection to tell if he hits the sides of the canvas or another object, and have Mr. Stick man drop if he runs off the edge of a platform. We also make a door that Mr. stick man can go through, ending the game. The book also provides an Afterward that discusses some additional options for doing basic game development Alice, Scratch and Unity3D, PyGame, which is a dedicated library for making games, band a discussion of other programming languages and a super quick look at what they do , where to get them, and what it takes to make a “Hello, World!” program. The Appendix highlights keywords in Python, and the glossary defines a number of words kids might not hear in their everyday interactions. 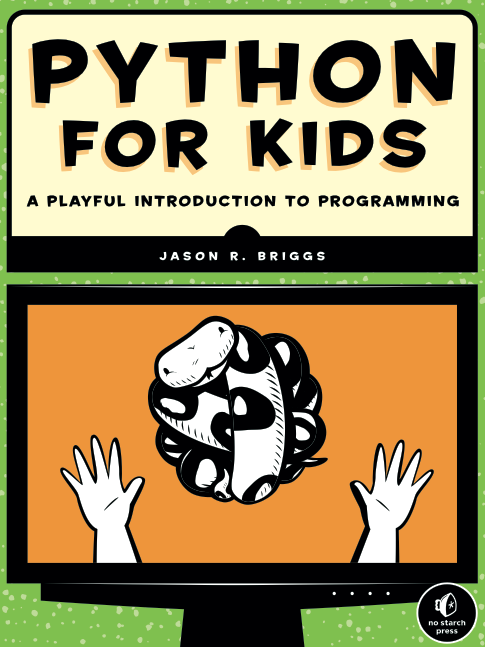 Python for Kids clocks in at a little over 300 pages, but you won’t feel like it as you work through it. There are numerous small projects and samples to examine, and all of the solutions to the puzzles and challenges are available at http://python-for-kids.com/. While this book is geared towards kids, there’s plenty in here to keep adults engaged and focused. Often, programming books are plagued with the “implied knowledge” trap that happens so often, where small projects give way to bigger ones, without a clear understanding of how the jump was made. Python for Kids does a very good job of avoiding that problem. Having kids as the primary audience, they take their time explaining key areas, and yes, for programmers with a little work under their belts, this is going to probably seem remedial, but as an introduction to Python, I think it’s first rate. If you are looking to give your kids a kick start in learning how to program, if Python seems like an interesting language to start with, and if you’d like to have a couple of tangible projects to play with and augment as you see fit, then Python for Kids should be on your short list of programming books… provided having fun while learning is a priority. 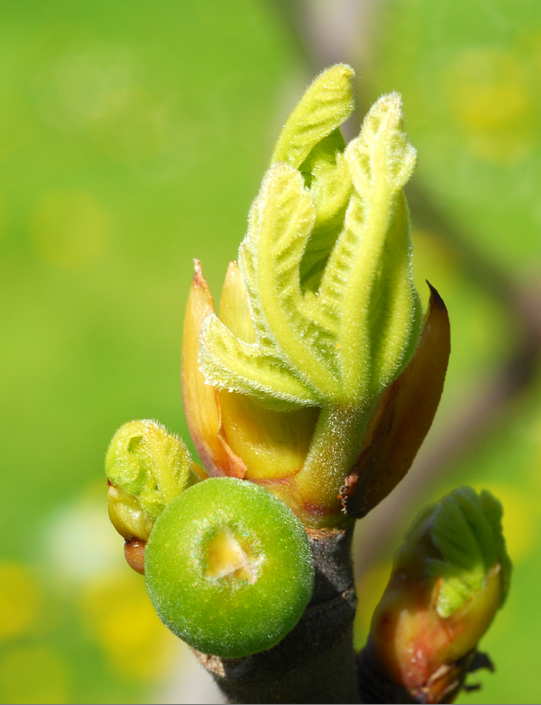 How I am Overcoming "Expectational Debt"
A phrase I have personally grown to love, and at times dread, is the one that Merlin Mann and Dan Benjamin coined in 2011 during their Back to Work podcast. That phrase is "expectational debt". Put simply, it's the act of "writing checks your person can't cash" (there's a more colorful metaphor that can be and is often used for this, but I think you understand what I mean ;) ). Expectational Debt is tricky, because it is very easy to get into, and it is almost entirely emotional in nature. Financial debt is when you have to borrow money to purchase something you want or need, and it invariably involves a financial contract, or in the simplest sense a "personal agreement" where the money owed will be paid back. It's very tangible. Technical debt is what happen in software all the time, when we have to make a shortcut or compromise on making something work in the ideal way so that we can get a product out the door, with the idea that we will "fix it later". Again, it's also tangible, in the sense that we can see the work we need to do. Expectational debt, on the other hand, is almost entirely emotional. It's associated with a promise, a goal, or a desire to do something. Sometimes that desire is public, sometimes it is private. In all cases, it's a commitment of the mind, and a commitment of time and attention. I know full well how easy it is to get myself into Expectational Debt, and I can do it surprisingly quickly. People often joke that I have a complete inability to say "no". That's not entirely true, but it's close enough to reality that I don't protest. I enjoy learning new things and trying new experiences, so I am often willing to jump in and say "yeah, that's awesome, I can do that!" With just those words, I am creating an expectational debt, a promise to do something in the future that I fully intend to fulfill, but I have not done the necessary footwork or put the time in to fully understand what I am taking on. Human beings, in general, do this all the time. We also frequently underestimate or overestimate how much these expectations matter to other people. Something we've agreed to do could be of great importance to others, or of minor importance. It's also possible that we ourselves are the only ones who consider that expectation to be valuable. Regardless of the "weight" of the expectation, they all take up space in our head, and every one of them puts a drag on our effectiveness. Before I offer my solution, I need to say that this is very much something I'm currently struggling with. These suggestions are what I am doing now to rein in my expectational debt. It's entirely possible these approaches will be abandoned by yours truly in the future, or determined not to work. As of now, they're helping, so I'm going to share them. Get a stack of note cards, or use an electronic note file, or take a 365 day single day calendar, whatever method you prefer, and sit down and write out every promise you have made to yourself and to others that you have every intention of fulfilling. Don't just do this for things in your professional life, do this for everything you intend to do (family goals, personal goals, exercise, home repairs, car repairs, social obligations, work goals, personal progress initiatives, literally everything you want to accomplish). My guess is that, after you have done this, you will have a few items that are in the I category (Urgent and Important), possibly a few in the III category (Urgent but Not Important), and most will fall into Categories II and IV. Redouble or Abandon Your "Commitments"
- Why do I think it belongs here? - Will it be of great benefit to me or others if I accomplish the goal? - Is it really my responsibility to do this? - If I were to not do this, what would happen? This will help you determine very quickly where each of the items fall. Most expectational debt will, again, fall in categories II and IV. For your sanity, as soon as you identify something that falls into Category IV (Not Urgent and Not Important), tell yourself "I will not be doing this" and make it visible. Yes, make a list of the things you will NOT be doing. Next is to look at the items that fall into Category III. These are Urgent but Not Important, or perhaps a better way to put this is that they are Urgent to someone else (and likely Important). They may not be important to you, but another person's anxiety about it, and their visible distress, is making it Urgent to you. It's time for a conversation or two. You have to decide now if you are going to commit time and attention to this, and figure out why you should. Is it because you feel obligated? Is it because it will solve a problem for someone else? Is it because you're really the only one who can deal with the situation? All of these need to be spelled out, and in most cases, they should be handled with a mind to train up someone else to do them, so that you can get out of the situation. The great majority of things you'll want to do, and want to commit to, will fall in Category II. 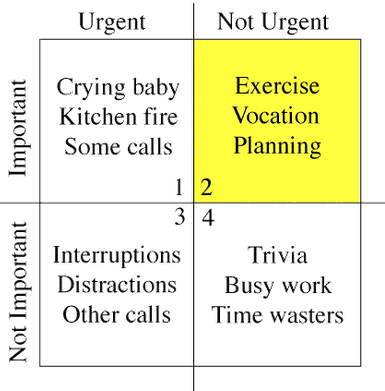 They are Important, but they are not Urgent (if they were Urgent and Important, you'd be doing them... probably RIGHT NOW!!!). Lose weight for the summer. Learn a new programming language. Discover and become proficient with a new tool. Plan a vacation for next year. Read a long anticipated book. Play a much anticipated video game. These are all items that will, in some way, give us satisfaction, help us move forward and progress on something, or otherwise benefit us, but they don't need to be done "right now". Your goal here is to start scoping out the time to do each of these, and give it a quantifiable space in your reality. I believe in scheduling items that I want to make progress on. In some cases, getting a friendly "accountability partner" to check in on me to make sure I'm doing what I need to do is a huge incentive. A common tactic that I am using now is to allocate four hours for any "endeavor space". I also allocate four hours in case I need to "change tracks" and take care of something else. This may seem like overkill (and often, it is), but it's a shorthand I use so I don't over-commit or underestimate how long it will take to do something. Even with this model, I still underestimate a lot of things, but with experience I get a bit better each time. This of course leaves the last area (Category I), the Urgent and Important. Usually, it's a crisis. It's where everything else ends up getting bagged for a bit. If you ever find yourself in an automobile accident, and you are injured, guess what, your getting treatment and recovery rockets to Category I. In a less dire circumstance, if you are the network operations person for your company and your network goes down, for the duration of that outage getting the network to work is Category I.
I hate making promises I can't keep, but the truth is, I do it all the time. We all do, usually in small ways. Unless we are pathological liars, we don't intend to get into this situation, but sometimes, yes, the expectations we place on ourselves, or the promises we make to others, grow out of proportion to what we can actually accomplish. Take the time to jettison those things that you will not do. Clear them from your mind. Make exit plans for the things you'd really rather not do, if there is a way to do so. Commit to scheduling those items that provide the greatest benefit, and if at all possible, do what you can to not get into crisis situations. Trust me, your overall sanity will be greatly enhanced, and what's more, you'll start to develop the discipline to grow an expectation surplus. I'm working towards that goal, in any event ;). As many of you are no doubt aware, I have a very long list of books that are in the hopper to be read, processed, applied and reviewed. Those books all come from somewhere. Some of them I buy, but a fairly large percentage of them are given to me (with the proviso that I review them). NoStarch Press has been a partner with me in this process for the past four years. I am very appreciative of their contributions to my technical knowledge and understanding. It's with this in mind that I want to alert TESTHEAD readers to a special offer. NoStarch Press and the folks at Humble Bundle have teamed up to offer a jump start for kids who want to learn programming and other technical skills. This is really significant right now for me, as I have a 14 year old daughter in the early stages of learning how to program. What could that special offer be? I'm glad you asked ;). Until February 18, 2015, 2:00 p.m. EST, Humble Bundle will be offering the "Humble Braniac Book Bundle". This is a variety of e-books geared towards kids so that technical subjects are more accessible to them. What makes this bundle interesting is that YOU get to decide how much you want to pay for it. Yes, you read that right, you get to name your price for a selection of books that, if purchased separately, would cost more than $250. The LEGO Adventure Book, Volume 1: Cars, Castles, Dinosaurs & More! As if that weren't enough, all Humble Bundle promotions let purchasers choose how much of their money goes to the publisher (NoStarch), Humble Bundle, and charity. The two charities supported by this bundle are the Electronic Frontier Foundation (EFF) and the Freedom of the Press Foundation. NoStarch has been great to me for many years. I really appreciate their willingness to provide me books to review. To be transparent, I have many of the books in the list already (that NoStarch gave me for free to write reviews), but there are several in this bundle that I don't have, and I have bought in for the Full Monty :). This Humble Brainiac Book Bundle ends February 18, 2015 at 2pm EST time, so if you want to take advantage of it, best get a move on! If you have already purchased your Humble Brainiac Book Bundle, go to the confirmation email and click on the download link... the new books have been added and you can download them from there. Yes, they've been added to orders already purchased. Nice job, Humble Bundle and NoStarch... well done :)!!! One of the things I enjoy hearing about is when engineering teams give credit to their testing teams and customer support teams. Both play important roles. In fact, it’s common to see software testers and customer support people wear each others hats. I personally spent a few years in my career doing both roles simultaneously, so I appreciate how, in many ways, customer support and software testing are two sides of the same coin. Imagine my smile when I read "The Incredibly Obvious Secret: Finding (and Fixing) Product Bugs Through a Close Relationship Between Test and Customer Support”, written by Jay Kremer and posted to the Zoozk Engineering Blog. How, might you ask, would I think to be looking at an online dating web sites engineering blog? For that, I have to thank the great group of software testers who attend the Bay Area Software Testers Meetup group. One of them is the Test Manager at Zoosk, and he told me about this article and suggested I have a look. OK, yeah, that test manager is Jay ;). In any event, I felt a lot of kinship with this post, and I wanted to have a chance to reply to it and say that, yes, there are organizations that do have this kind of relationship in addition to Zoosk. I work for one of them. At Socialtext, if a customer reports an issue, the first line of contact is a real human being who walks through the issue with them. The support engineer can often see the the potential value of the bug in question (it’s real, it’s reproducible, it’s potentially impactful, and it has a high probability of affecting a number of people). At this point, that support person can contact us, or we can go over to them and say “hey, anything interesting coming in?”, and they will tell us what they are working on. Socialtext has the approach that bugs get on the Kanban board as soon as we can identify and reproduce the issue (again, the easier it is to quantify the problem, the easier it is to fix, generally speaking). 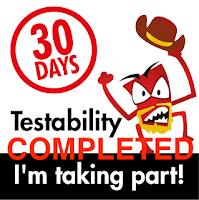 It is not at all uncommon to have a bug be reported one day, scheduled in the Kanban and picked up on the second day, a fix committed and tested, and then merged to our staging environment in short order thereafter. We are a company that runs most of our businesses processes on our product. This makes us, essentially, the primary alpha and beta testers, which in turn allows us to address bugs quickly, at least most of the time. It seems that Zoosk has a similar philosophy. I have often said that customer support engineers make for awesome testers, and software testers can often make amazing support engineers. Like Jay, I believe this is a symbiotic relationship that needs to be enhanced and encouraged, and more testing organizations should make that connection and work closely with their support teams, not just for when they report issues. Software testers can learn a lot about the true state of their product and the workflows that really matter by spending some quality time with the support team. I think you will be pleasantly surprised with what you learn.